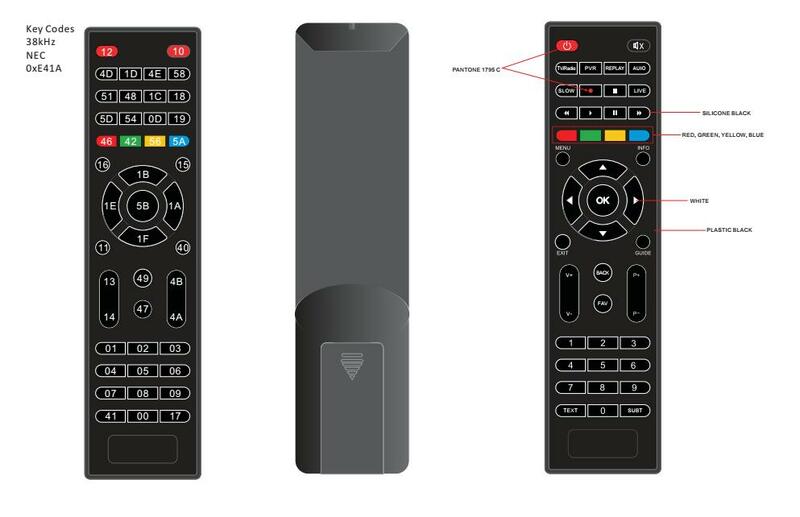 I want to create a bin file with the RC codes for my remote control. The problem is that I have the codes for all the buttons, but I don't know how I can export them to a bin format. The key codes are 38KHz NEC 0xE41A. A picture of the RCU could be found at http://imgur.com/WNaWaDG I also have a learning remote control Terris UFB 244 which has a USB interface for connection to a PC but didn't find a way to connect it to any of the programs listed in this forum. Any hints how I can do that would be greatly appreciated. My last hope is eventually to use a microphone with winLirc. So if you have any advices or detailed instruction how I can convert the codes from WinLirc to the Slingbox format, let me know. What is the make and model of the device that you wish to control? Thank you very much guys, the box is Openview HD. I will test the bin file which you prepared and let you know if it works. By the way how did you prepare the bin file only from the hex codes? By the way how did you prepare the bin file only from the hex codes? It wasn't just hex codes, that remote image also said that the protocol was NEC. Now, we have several different formats of NEC, but NEC1 is the more common, so I took a guess there. the codes work very well, I have tried the numbers, exit, guide, menu, arrow up, down, left, right, ch+, ch- and all worked. I didn't find a back button on the virtual remote, but this is not a big deal for me and initially when I tried to upload the bin file it showed me an error about unable to load the custom codes, but when I restarted the setup process the codes were already loaded and it was working OK. Anyway, thanks again for your support. I put "back" on both the EXIT and PREV CH buttons.